I found this bench in Rubislaw Terrace Gardens in Aberdeen and a couple of things about it got me thinking. Kamila I will always love you, always, landslide. This is my favourite part of the bench. As I’m sure you’ve noticed, this is scratched in the same handwriting (handscratching?) as the above line. The bench is in a park just to the west of Aberdeen’s city centre and is surrounded by offices, shops and schools. I like to picture Kamila taking her lunch break at her usual bench and finding this lovely message for her. A slightly illegal birthday treat. Yes, that’s definitely what I was meant to do. Edit: On the 5th May 2011, over a year after writing this, the bench was been re-painted by the council, covering up the graffiti. 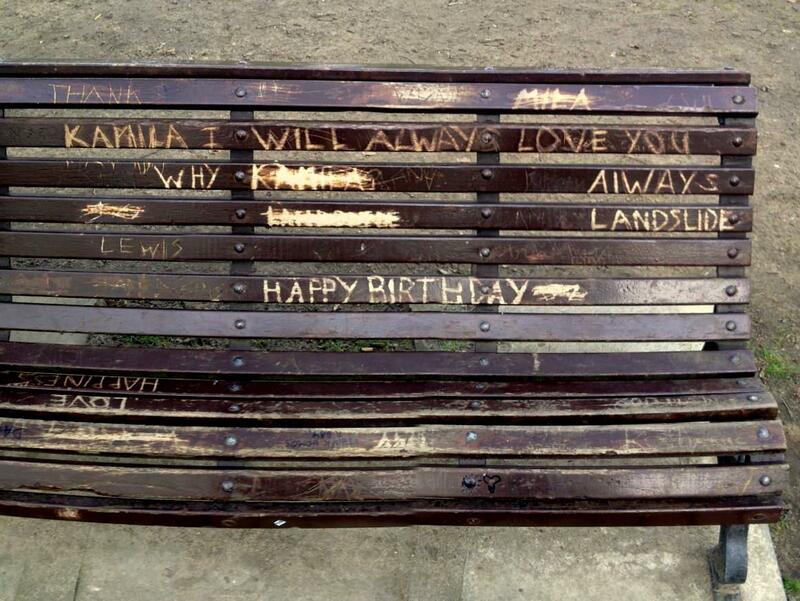 I never did find the right Kamila, but I hope she found her bench.